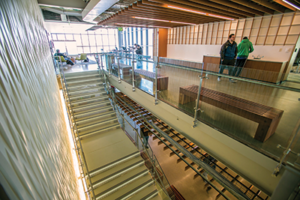 CSU’s spectacular new northern gateway to campus, Donald E. Washkewicz Hall, provides enhanced educational and research opportunities for engineering students and faculty. Those opportunities were enriched with the surprise announcement of a $1 million gift from Don and Pam Washkewicz during the building’s ribbon-cutting and dedication ceremony. The new engineering building was made possible by a combined $20 million gift from the Washkewiczes and the Parker Hannifin Foundation. 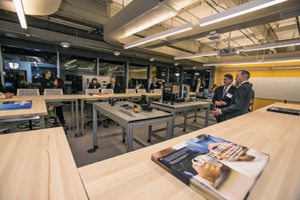 It includes teaching and research laboratories, simulation labs for computer modeling, student collaboration spaces, smart classrooms, and more. The four-story facility also features the Dan T. Moore MakerSpace, where students can transform their ideas into reality using state-of-the art technology, and the Parker Hannifin Human Motion and Control Lab, which is developing innovative orthotics and prosthetics to assist individuals with mobility issues. The facility was financed through a public-private partnership, with capital funds provided by the state of Ohio. Additional support was provided by Dan T. Moore and the estate of Frederick H. Ray. Alumnus Washkewicz graduated from CSU with a degree in mechanical engineering in 1972 and joined Parker Hannifin the same year. He rose through the ranks to ultimately become president, chairman and chief executive officer, and proudly says his education provided the foundation for career success. He retired in 2016. Through the years, he and Parker have been among CSU’s strongest partners, supporting the Human Motion and Control laboratory and other labs, equipment and technology, endowed professorships and scholarships, the annual Radiance scholarship event, a new Administration Center and renovation of a building for the College of Graduate Studies, renovation of the Allen Theatre for the CSU arts campus, and more. Parker also regularly recruits and hires graduates; through the years, hundreds of CSU alumni have worked for the company across the United States. Washkewicz recently served as co-chair of ENGAGE: The Campaign for Cleveland State University. 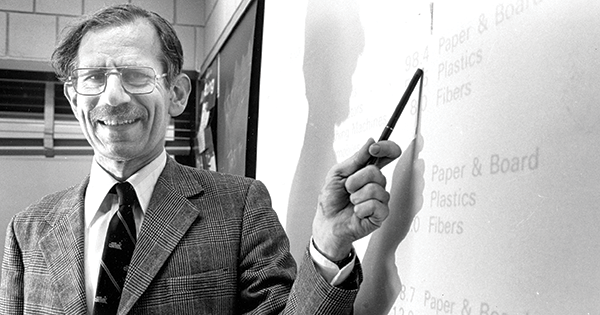 In recognition of his transformational impact and belief in CSU and its students, the College of Engineering was named in his honor in 2013. His surprise announcement of an additional $1 million wowed the capacity audience at the ribbon-cutting and dedication dinner. The Washkewicz Scholars Program provides full academic scholarships for undergraduate students in an engineering discipline, including civil, mechanical, electrical, computer and chemical engineering. President Berkman called the couple “true champions of CSU whose support has helped transform our College of Engineering into a powerhouse of innovation and opportunity for students and faculty, placing CSU at the forefront of engineering education and research. 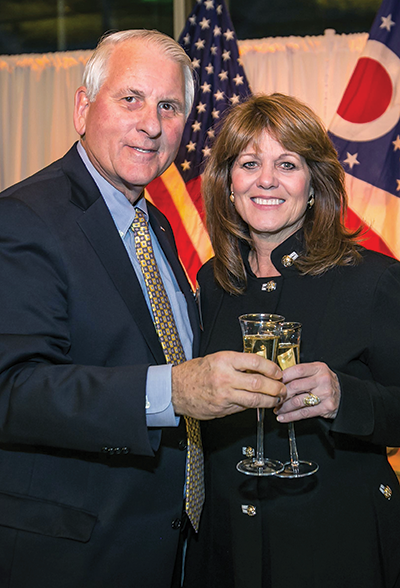 “Through their generosity, Don and Pam are helping to ensure that CSU graduates are ready for the jobs and leadership positions of tomorrow,” he added. With more than 2,500 students enrolled across six majors, the Washkewicz College of Engineering has experienced unprecedented growth, with undergraduate enrollment more than doubling over the past decade -— a strong signal that the College of Engineering has become the college of choice for traditional full-time students across the region. Through their generosity, Don and Pam are helping to ensure that CSU graduates are ready for the jobs and leadership positions of tomorrow. 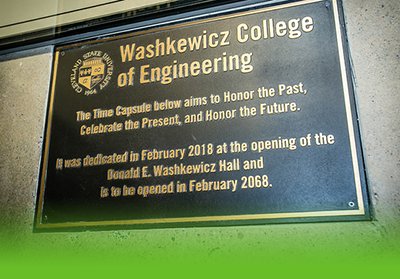 A time capsule in the new Donald E. Washkewicz Hall celebrates the present while honoring the past and future. Buried in the floor just inside the main entrance, the capsule is filled with correspondence from faculty and staff, photos, books and more. It was dedicated during National Engineers Week and is meant to be opened in February 2068. We hope the additional support … will enable the CSU engineering program to do even more to make engineering a core driver of job growth and economic opportunity in the region.